I bought my first Glengoyne a while ago and it was part of the first batch of single malts I bought to start my collection. I remember looking at the bottle and the color of the spirit inside and knowing instantly that this was going to be something special. It was of course this wonderful 21 year old. The first one I tasted was part of the older labeling and was a 2009/2010 bottling. The one I'm writing about now is from the new look bottle and is a 2013/2014 bottling. The label and the look may have changed but the craft certainly hasn't. Though I remember enjoying the earlier bottling a bit more. Glengoyne pride themselves on having the slowest distilling process in all of Scotland; a method they believe extracts the best flavors. The new make spirit is distilled at around 5 liters per minute which allows longer contact with copper and therefore optimal absorption of sulfides while accentuating esters and aldehydes resulting in a smoother spirit. Nose: Cinnamon. Chocolate fudge. Black peppers. Figs. Raisins. Christmas cake. Eggnog. Mens' cologne. Prunes. It's a warm and comforting nose. The sherry is deft and the spices brilliantly balanced against the sweet. Palate: Maple syrup. Cinnamon. Black pepper. Nuts. Chocolate fudge cake. Christmas cake. The nose translates quite nicely on to the palate. Though, I might have liked a few more percentage points of alcohol. Just to bring up the intensity of the flavors. Finish: Long-ish. Oily. Big cinnamon. Black pepper. Oak. Tobacco leaf. I'm pretty sure earlier bottlings were better but this is still a might fine dram. This is part of a search through written (paper) reviews and samples from (unmarked) bottles that have been looming (forgotten!) in my collection over the years. I will at the end of this series do a re-tasting of some Springbank 12 batch 5 and then do a comparison with the newly released batch number 9. But first things first, this will be my first review of this "cupboard findings" series, it's the old(older) version of glengoyne 21 yar old. Nose: Almonds and natural (almond-y) marzipan, lush sherry. Hint of japanese plum dessert jelly. Oranges, hazelnuts and a rhubarb/pear pie note. Palate: Bitter-sweet barley note meets a sweet, full bodied and sour sherry note comprised of apples, candied oranges, crême brulée and marzipan. Development reveals some vanilla tones and blackcurrant. Finish: Barley sugars return with some lush sherry oak and some orange-peel. A simple but tasty laid back sherry vet. Reminds me of the Glendronach 15, with less complexity & vitality. However this makes me really want to try the new version as this was quite pleasant and the new glengoyne 18 year old i tasted recently blew my socks off! 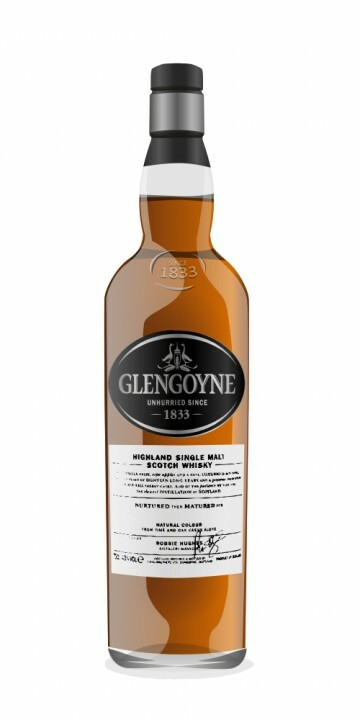 Glengoyne is a brand that is well priced here in Sweden so it will be a purchase for next year hopefully. I recently began a discussion concerning sherried whiskies. As always, my fellow connosr members were very helpful, and replied with no shortage of wonderful suggestions and ideas. Among the many distilleries recommended was Glengoyne. I hadn’t sampled anything from Glengoyne before, so my interest was piqued. Soon after, I came across a friend who happened to have a bottle of the 21 yo on hand, so I jumped at the chance to try it. The bottle was ¾ full, and had been open for no more than two months. Nose: Big sherry, big chocolate, big treacle. Rich, layered spices, with cinnamon, nutmeg, ginger, demerera sugar and allspice. Berries, apples, faint floral/brandy notes. This is a fantastic, deep, rich nose with beautiful sherry spices. Palate: Somewhat oily, with a generally medium mouthfeel. The arrival of the flavours is very gradual. There are indeed some strong dried fruit notes in here, but the sherry influence takes a back seat to the oaky spiciness. The spices are dominated by ginger, pepper, and nutmeg, with very drying and spicy that seems to dominate here. The sweetness on the palate is subdued by a strong wood/bitter note. Finish: Continued oaky, spicy, bitterness. Quite salty. Chocolate, raisins, salted almonds, and a hint plum. And there’s that floral brandy note again. The flavours linger, but quickly lose intensity throughout the medium finish. This whisky is unique, but I wasn’t charmed by it. On one hand, it’s got so many features that I like. Beautiful, layered spices, not overly sweet, some lovely sherried notes, and something of a floral character. It’s very rich and quite complex. On the other hand, I feel that there’s a definitive lack of balance. The nose is fabulous, and my favorite part of the whisky. The arrival is strangely gradual and the finish strangely abrupt, which I found off-putting. And I felt a bit disappointed that the oaky bitterness quickly overwhelmed the sherry fruitiness that the nose had promised. Is this whisky over-oaked? I think so. This is good, but it’s not great. As this is my first Glengoyne, I’m not ready to dismiss the distillery as a whole. It’s clear to me that there’s quality here, but I think that I might prefer a younger expression. I agree very much with this (although you have been much more complete than I was! ), except I feel bad that you found the spices "too" bitter. For me, that sherry fruitiness did hold its own against them. I wonder whether more than the 2 months could eventually help this malt? About your further exploration... From my little experience with the 10&17&21, I would say that the 21 stands out; you've started at the top! (Ok, I have not tried the 40...) The 17 is good, though, if you really relish woody oak. @vanpelt: I don't know how this whisky changes over time, so I am indeed willing to give it another go at a later date. My issue was not so much that the spices were too bitter, it's that they seemed to dominate to such a point that the balance was upset. Also the arrival and finish just seemed weird to me. There's a lot going on in this whisky to keep you interested, I'm just not convinced that I would want to buy my own bottle. I am curious about the 17, however. Thanks for the suggestions! Colour is mahogany. It's really pretty, Nosing, it's extremely rich sherry aromas come to the fore. Sweet and toffee flavoured to start, moving to black licorice on the finish. Neil swears there is a touch of Mauby Fizz. This is a sensational drop. Bit expensive here in Australia so probably won't have the pleasure of picking up a bottle any time soon. As you say though, sherry is the major theme here! I remember getting leather, wood polish, Christmas cake, cherries, all sorts of candied fruits and sweet toffee notes on the nose and the palette sure delivers what the nose promises. I didn't get any licorice though.. Nose: Pleasing confluence of gingery apple crisp, cherry cobbler-- and chocolate sauce. Palate: A brief sweetness of sour cherry quickly turns to a showcase of oaky spices like ginger and nutmeg. Finish: Deep sweet and spicy warmth. Long lasting. A definite joy, I can imagine this drunk in a Dickens Christmas. More complex and better balanced in all flavors than the Glengoynes 10 and 17. The spices could maybe be balanced by more deep fruit, but it is hard to complain: The 21 is easy and interesting to drink. Couldnt agree more with your review, i reviewed it myself and was impressed at how easy the dram is to drink, and even for a 21yr old how smooth it is, which to me seemed to fit in with the majority of Glengoyne expressions. Beautiful floral nose interspersed with ground nuts like almonds and a subtle spiciness brought on by nutmeg. A surprisingly curious delivery. Starts of sweet with a mixture of toffee and hints of citrus and as it prepares to go down the gullet some one throws in a big stick of cinnamon laced with lovely spices! A very distinct and satisfying finish. Well I’ve tried and reviewed both the 10 and 17 year Glengoyne malts, and done a few video reviews of others in their range, but now its time for me to move up from my previous reviews and look at the 21 year old. This is matured in a Sherry cask, so already you expect a certain look and set of features to be apparent in the malt, and in a way it doesn’t disappoint there. The colour is clearly affected by the Sherry cask, it’s very dark to look at. To smell it is to catch a bit of the sherry, along with a bucket-load of spices and strong flowery notes. When you take the plunge and take a sip, the first thing you notice is that even with this 21 year old the Glengoyne smoothness that I’ve experienced through the range is still there, its not been removed with age or the differing barrels/casks. The experience grows with time, as the sherry slowly appears, along with a sweet and fruity taste. It has the longest finish I’ve experienced with Glengoyne, and it lingers so long that it continues to give you a warm feeling for some time! After moving up through the range, this is the highest quality of the 3 I’ve reviewed, it’s an excellent whisky that could and should be savoured. Review is very consistent with my thoughts in terms of smoothness, balance and finish, personally gave it 93 pts. I spent a LOT of time nosing this one across two sessions. I got fruit cake (candied fruits), varnish (but in a pleasant way), citrus, cream, chocolate, a hint of roasted coffee, custard apple in addition to the expected sherry and sweetness. Mouthfeel excellent, harmonious combination of sherry, citrus and malt and nothing out of place. Finish long, gentle and satisfying (leaving a soft, cerealy / biscuity taste) but can't help but feel if there were an extra dimension here (like a kick-back of citrus) it would have really added a couple of points to the score. Side note: When first tasted, I got some "coal gas" on the nose and some off notes in the taste too that I couldn't fully identify. Still ended up scoring about 85 points, it was nowhere near as bad as the 10 year old version I'd tasted prior. Anyhow, after two or three weeks, upon second tasting of the 21 yo, ALL off notes had disappeared. Could this have been bottle shock? Granted, this was a 50cl sample bottle. Now I'm really keen to get a full 70cl bottle that I can enjoy next winter! I totally agree with this review. This is such a smooth and beautifully rounded dram. The way it coats the inside of your mouth is quite incredible, it's like liquid silk running over your tonsils. Strong sherry infleuence and adorable sweetness. I toured the Glengoyne distillery this summer and tasted the 10, 17 and 21 year olds (as well as the cask strength 12 year old). All have that lovely fruitiness, which deepens and darkens as you go through the age range. Unless you're a totally committed peat lover I'd recommend trying something from Glengoyne. A little introduction is in order for my title. Back when I had a far more inexperienced palate and was quite ignorant of the whisk(e)y world, I did not think for some reason I would ever enjoy Highland whiskies. Good thing I was introduced with this whisky, as it shut my trap and opened my mind to the highlands. Without any more wasted words, my review. N:Caramel and vanilla, with hints of apple beneath. Lightly poached green fruit and cinnamon with malty cereals. A spice follows but is not very prominent along with buttery toffee. Notes of sultry dark chocolate waft about. B:Medium amount of oil showing on the glass with thick beads on a large lip, with legs of moderate thickness falling slowly. The colour is a dark, rich copper. T:A neat fruit medley opens on the palate and soon changes into baked apple, cinnamon sweetness with a lightly toasted feel. Christmas cake is introduced with syrupy pears followed by a good dose of reoccuring dark chocolate. F:Vanilla starts off soon changing to heather honey. The honey feels glazed and forms into more vanilla effortlessly making a very smooth mellow sweetness. More baked goods and apple joins the lot giving the feel of a rich apple fritter with glazed vanilla drizzled on it. This whisky is amazing, I personally love it but seldom get around to opening it for reasons unknown. Either way I look at this whisky I get a good feeling about it. The colour is so rich and the body of the whisky on the palate really follows suit. A definite recommendation to all interested in the Glengoyne line. Why is your rating a mere 82 if you find this whisky "amazing" and you "personally love it"?